Longer raises, bigger machines and larger diameter drill rods have been the focus of raise boring for many years. However, some of the focus is now shifting to smaller, more mobile and versatile solutions, as Signe Hansen discovers. Developed, in 1962, to replace hazardous manual shaft construction, today raise boring is the most common method for underground construction of ventilation shafts, material passes and manways. However, while the basic concept has remained the same, there have been significant improvements to the technology's capacity. Equipment has become more powerful, more precise and safer. Specifically, there has been a trend towards larger diameters and longer raises. While this trend is highly efficient, it has also led to increased preparation and installation time. Hence, some within the industry are now focusing on alternative, smaller and more flexible solutions that can be quickly assembled, transformed and applied for multiple purposes. "There's a current trend towards large machines, of large diameters, but these are typically used for one-off projects as they're very big and heavy. 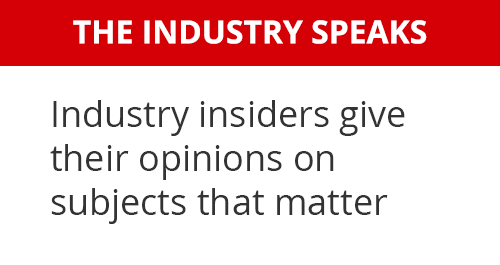 In fact, they're the exact opposite of a versatile solution, and we don't believe they're a logical use of resources - just because something is mechanically possible it doesn't mean it's sensible; after all, size isn't everything," says Bruce Matheson of Terratec. The small and more versatile solutions becoming available also opens up a number of potential new applications. 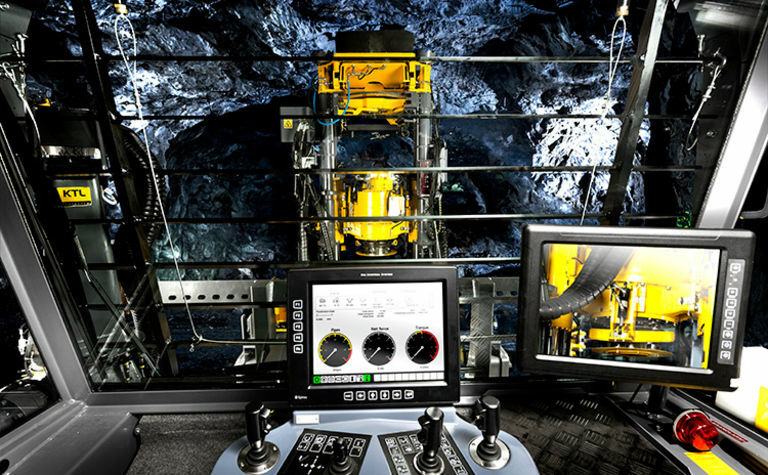 The new developments towards more flexible raise boring solutions originate to a significant extent from demands from miners and contractors for equipment with higher usability on site. This means equipment that can be used not just for raise boring but in production as well. While typical raise boring projects, such as ventilation shafts, are often large in diameter, hundreds of metres long and can easily take weeks or even months to complete, several, often distantly located, short raises are often required in underground production drilling. Hence, the demand for fast, mobile and flexible solutions. Having encountered this demand for versatility, in 2014, TRB-Raise Borers created the Rhino 100, a new type of highly mobile, self-contained raise borer for underground production drilling. Mounted on rubber wheels, operated by one operator, and with a setup and demob time of 15 minutes, the Rhino is an efficient tool for raise boring and slot raises in production drilling. As such, it can increase underground productivity and efficiency while improving safety, says Jarko Salo, CEO of TRB-Raise Borers. "We have a new solution called Rhino 100, which addresses the negatives of the previously known raise-boring method in production drilling. Now, ‘a slot drilling ecosystem' is reality and the results and benefits have been considerable. Just one rig, one operator, and one work order is required to complete the slot raise. This simplifies underground operations greatly and brings stopes online much quicker." It was also industry demand that led to Terratec producing its UB1000-R16 Universal Box-Hole Borer. 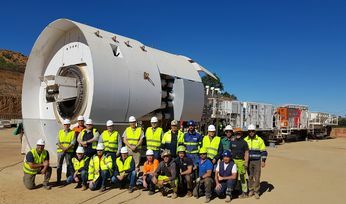 As a matter of fact, the UB was a result of a specific request for a 1.06m diameter box-hole boring machine which could be quickly switched to operate as a conventional raise borer capable of pulling up to 3m diameter holes. "Cost-efficiency has demanded that contractors can use equipment for more than one role so the hunt has been for versatile solutions such as our UB1000," says Matheson. Epiroc too has developed its range to include a smaller and more mobile raise-boring machine. "Normally, a raise boring machine is bolted to the ground due to the high forces used. But when in production, this must be done in a different way. 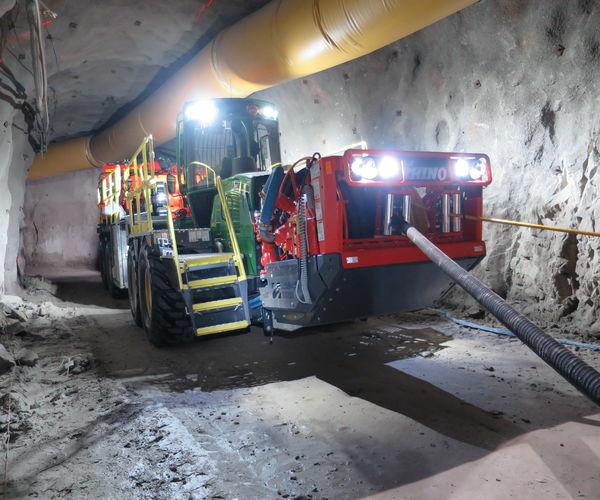 Therefore, we have developed a smaller machine that is attached to an Epiroc underground carrier, called Easer L. This machine drills 750mm holes without the need of a concrete pad as it uses stinger cylinders to brace is self," explains Markus Pettersson of Epiroc Underground Rock Excavation division.  Apart from a demand for greater mobility and flexibility, recent developments have been driven by tightening safety legislation and a growing need for greater reliability. In Australia, for instance, where Terratec's UB1000-R16 Universal Box-Hole operates, legislation requires automatic rod handling. "All the rods are handled by the machine - there's no need for a guy in the middle of everything," says Matheson. On top of automation, remote-controlled operations and data collection are also increasingly being applied in raise boring. Allowing operators to move away from unsafe operations and making it possible to run machines during shift changes, remote-controlled rigs not only increase safety but also productivity and cost-efficiency. 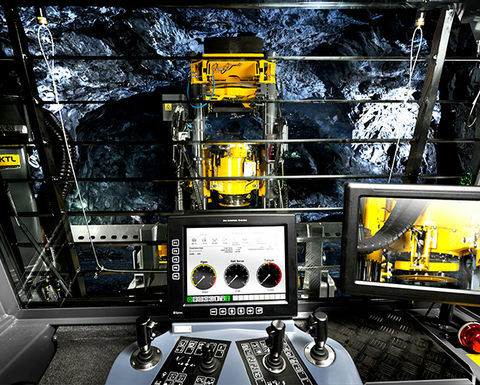 Epiroc uses its own system called RCS (Rig Control System). "This is used on all our raise-boring machines. Since it's a common platform for all of Epiroc's machines we share functionality and therefore we can use remote operation and monitoring that was originally developed for other rigs," explains Pettersson. Built-in automation can also prevent failures as it can react immediately and take appropriate action without help from the operator. Furthermore, as machines are connected to the internet, performance data can be sent and evaluated. "Next step is probably to make the machines more autonomous and mobile. These are two important areas that our customers are asking for. They want to move the operator away from the machines to make the working environment as safe as possible. Machines with autonomous functionality help with that," says Pettersson. "Raise boring machines that are mobile and don't need other equipment to move from one site to another help with the planning and decreases the time and cost for the customer." However, though this style of mobile, versatile and technologically advanced raise-boring rigs presents a new trend in raise boring, it is not just innovation but also ‘retrovation' which is the key to moving forward, says Matheson. "For the contractors, it's all about mechanical reliability - they want a machine that can go into a project and do a bunch of ventilation shafts; a raise unit they can keep in there for a long time. That's why to some extent it's not about innovation but retrovation; it's about using more hydraulics than electronics - our derrick and Universal Box-Hole Borer is all hydraulic because in a hostile environment for electronics with mine water falling onto the machine when box-holing, the electronics will not last." Terratec's UB1000-R16 Universal Box-Hole Borer went into service working in a narrow vein gold mine in Western Australian Gold Fields, in late 2014. It was used to produce box-holed stope slots and escape ways along with some larger, conventionally raise-bored, ventilation shafts. Initial box-hole trials were successful and, in mid-2015, a number of improvements were identified and incorporated to the rig. The machine then went on to operate almost continuously for over two years with 9,736 operating hours of drilling, box-holing and conventional raise-boring. During the two-year period, approximately 200m per month of 1.06m diameter box-holes were bored on an ongoing basis. 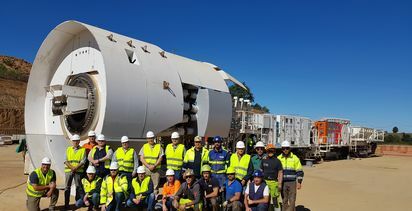 Typical turn-around between box-holes was just under three days, including mobilisation, set-up, drilling/boring, de-rigging, and crawler transport to the next site. A number of larger conventional raises were also done during this period, including several at 2.4m diameter x 80m deep, and one hole at 3.1m diameter x 85m deep, at a 70-degree dip angle. Agnico Eagle Kittilä gold mine (Finland) introduced their first Rhino 100 in 2014. After two years, 302 slot raises and more than 7,200m had been drilled. The mine uses the sub-level stoping mining method with an average stope height of 25m and a maximum of 40m. The original long-hole open stoping method required 21 drill holes for opening a drop raise in each stope and used the same conventional long-hole rigs used for drilling blast holes. The drop raises required five to six workdays (10 - 12 shifts) to construct, including all the drilling, blasting, re-drilling (necessary due to the challenging rock conditions presented by the sulphide-rich mineralisation) and hauling stages, and necessitated the use of two drill rigs and several crewmembers. Reducing the operational complexity was necessary if the mine was to achieve its production target of a minimum of 140 stopes per year (the target has been since upgraded to 200 stopes per year). Before 2014, none of Kittilä's raise borer operators had any experience with raise boring. Yet, soon they drilled 18 slot raises, totalling 478.6m, in one month. The new method also eliminated the safety concerns associated with live detonators and redrilling, because raise-boring slot holes eliminate the need to blast before the actual production blasts. It also freed up the 30 per cent of the long-hole drilling capacity previous used for opening up the drop raises for drilling the actual blast holes. Since 2014, Kittilä has relied on raise bored slot raises and now operates two Rhino 100 rigs on a daily basis. A raise can be over 1,000m in favourable conditions. 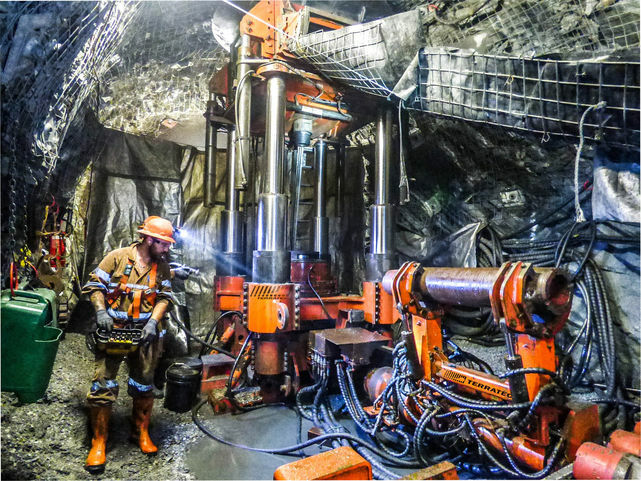 Conventional raise boring requires access to the top and bottom of the shaft and is done by first drilling a pilot drill down from one level to another. Then a larger drill, a reamer, is attached and pulled back to the machine using upwards thrusts. The reamer head can be up to 7m in diameter. It is the preferred method because it is safe - there is no need for personnel in the shaft; it is fast - a 500m raise with 2.4m in diameter takes approximately six weeks to drill -, and it is accurate - deviation of the pilot hole is normally less than one per cent. Box-hole boring is used to excavate raises where there is limited or no access to the upper level. Here, the machine is set up at the lower level and a full-diameter raise is bored upward. Blind shaft boring is used where there is access to the upper level of the proposed raise but limited or no access to the lower level. With this method, the raise is excavated from the upper level downward using a down-reaming system connected by a drill string to the machine above. Down reaming begins by drilling a conventional pilot hole, and then enlarging it to the final raise diameter by reaming from the upper level to the lower level. Raise boring is the most commonly used method for the production of long vertical shafts in underground mines, especially deep, hard rock mines. The technique is used to create ventilation shafts, access shafts, escape ways, ore passes, fill passes etc. It is also applied for mine production drilling, particularly for slot-raise drilling. Slot-raises refer to relief holes within a stope, intended to provide void space for blasting, thereby allowing ‘expansion' of the blasted rock and improving fragmentation. For use in production drilling, smaller more versatile and mobile rigs are often required.